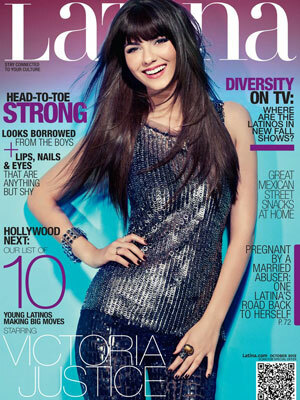 See the gallery for quotes by Victoria Justice. You can to use those 7 images of quotes as a desktop wallpapers. I listen to all kinds of music, honestly. I love 'Homeland.' I think it's such a well-done, well-acted TV show. I love fashion and there is no easier way to express yourself than through the clothes you wear. I love going to second-hand stores. I love making movies and hope to write my own screenplay someday and do some producing and be behind-the-scenes as well. I love my fans, and I try to keep in touch with them as much as I can. I think it's really cool how J. Lo's been able to balance an acting career and a music career. That's something I strive for. I think talent makes me really attracted to someone more than anything. I want to play a variety of different characters in different genres of film. I want to stretch myself as an actor. I want to work with producers who are unique and have a different sound. I will say that a lot of songs that I've written are from my own personal experiences which are special to me. I would love to work with Cameron Crowe; he's definitely one of my favorite directors. I'm not looking to shock anyone. I've always taken direction pretty well. I've never been a partier. If you love something, you have to stay really focused and can't let outside things distract you. If you're smart and you care about life, you'll take driving seriously. In a lot of ways, I wasn't a normal teenager. Just because something is on trend, it might not work for you. Much more quotes by Victoria Justice below the page. My day-to-day look is inspired by comfort, color and just how I'm feeling that day. My favorite TV show is probably 'Glee.' I'm a Gleek, like everyone else! My first concert was 'Nsync. My number one thing was that if I ever did get successful enough to make it, I wanted to be able to give back to my family. So many girls only care about guys and looking good all the time. To even be called the 'teen queen' is crazy. Well, I'm an independent person. When I was younger and first started watching MTV I loved watching TRL. I loved watching my favorite singers/bands perform. You have to be able to unleash your inner goofball with me. You know when you have a good relationship with someone when you are just perfectly happy to be quiet and just hang out and do nothing. If you've been driving for a little while and nothing's happened to you yet - and you've been texting and driving - you think, 'Oh nothing's going to happen.' But all it takes is an accident happening with one of your friends or God forbid, something happening to you, to really give you a wake-up call. Someone once told me that something they really liked about me was that they thought that I was really down to earth and not high-maintenance. I think that was cool. It's important to stay grounded. I think there's a perception out there that people know me based on these glamorous photos they see of me in magazines, but I have about two hours of hair and makeup and then people to dress me, to make me look even better, in those pictures. I was almost 8 years old when I was watching a kid on a TV commercial, and I told my mom that I wanted to do the same thing. She said that I would need to get an agent and that she would research it. I'd say that if you had a strained relationship with your mom, for whatever reason, the best thing to do is be open with each other, talk it over, try and work it out somehow as opposed to just putting a wall up and pushing them away. I'm half Puerto Rican and every Friday we have rice and beans and chicken in my house - so that's like a very Latin staple. It's just so comforting. I look forward to every single Friday because I just can't wait for my rice and beans and chicken. If you don't feel like you're ready to get your license - just because people are putting pressure on you, don't feel like you have to rush into something. Take your time, really feel confident and be ready. It doesn't matter what other people say, do what's best for you and makes you feel safe. People always ask me, 'Is there a rivalry between the Nickelodeon and Disney stars? Do you guys hate each other?' Like everyone has to be on one team. If you're a Selena Gomez fan, you can't be a Victoria Justice fan. We're both half-Latin, and people put us in the same category. Someone's career that I admire would have to be Justin Timberlake's because he started off on Disney and he made this huge film career and huge solo music career. I really respect him as an artist. When I was little I had this notion of being a marine biologist. I grew up by the ocean so I was always in the water but realistically, I don't think I would make the best marine biologist. If you're going through friendship issues, I would say, first of all take a step back. How important is the friendship to you? Sometimes, if someone's not being a good friend to you and isn't treating you the way you should be treated, then you kind of have to move on sometimes. As far back as I can remember though, I always loved performing. At a young age, I had to give up a lot of things, like being able to hang out with my friends. Both music and acting are huge parts of my life - it's all about balance. Everyone wants me to be perfect, but I am so far from perfect! Going to a concert is so overwhelming and the energy is amazing. Guys who are charismatic and fun-loving and sweet and generous are the ones I want to date. I am undeniably afraid of the dark! I can't hold a grudge anyway. I could work 24 hours and I wouldn't complain once because I'm happiest when I'm working. I do love getting dressed up, but sometimes it's glam and edgy mixed together. I don't really consider myself to be famous. I don't want to be the type of person to have my relationships plastered in magazines. I don't want to sing boring pop songs - I want to sing songs that are meaningful to me. I guess because people are more aware of who I am, they're going to wonder about my personal life. I like being active and riding a bike around my neighborhood and exercising when I can. I like people who can and like to make fun of themselves! I like to dress for my body type and for my coloring.